The Jesuits’ power grew so much that the Spanish crown got afraid of them and eventually expelled them from South America. 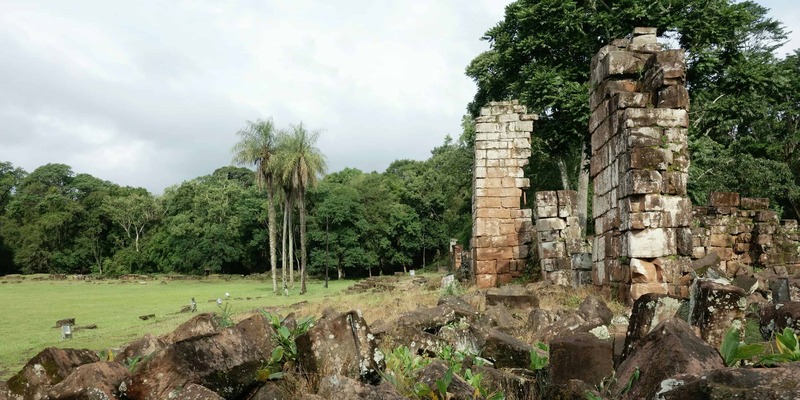 Their missions fell into disrepair and their ruins, located in Paraguay, Argentina and Brazil, can now be visited. To visit those sites, you should base yourself either in Encarnación, on the Paraguayan side, or in Posadas, on the Argentinian side of the Paraná river. Regular busses go from one city to the other. Remember that if you are not travelling with a South American passport, you will need to get off at immigration on both sides of the border to get stamped in and out of the countries. You always need two stamps in your passport for one border crossing. 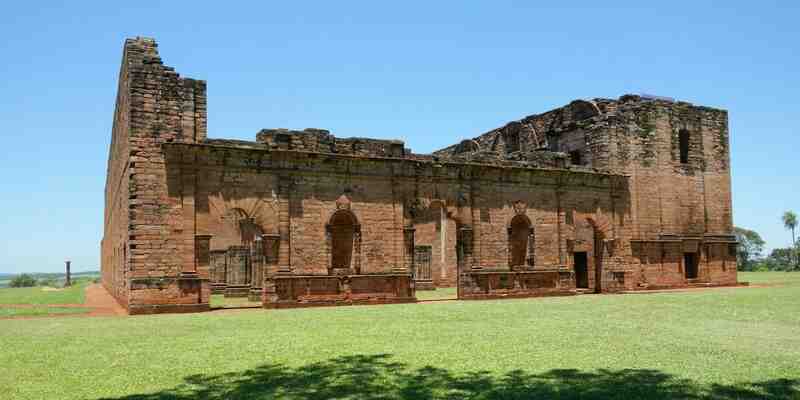 The largest Jesuit mission in Paraguay is located in Trinidad. To get there, you must first go to the bus terminal in Encarnación. From here, you will find lots of busses leaving towards Ciudad del Este via Trinidad. The bus drivers will find you and sell you tickets. If not, just ask around and someone will point out the right bus to you. As of November 2017, a bus ticket costs 10.000 guarani. If you do not have any Paraguayan money, you will see lots of money changers at the bus terminal. Just say ‘cambiar dolares’ (or pesos or whatever you have) and people will direct you towards the closest person willing to change money. With that money, you buy a bus ticket (and also a bottle of water if you don’t have one yet) and then leave for Trinidad. Make sure to tell the bus driver that you want to see the ruins in Trinidad and he will eventually tell you where to get off. It is a fifteen minute walk northwards from the bus stop to get to the ruins. Here, you will buy your entrance ticket and are then free to walk around the archaeological site as you wish. We barely saw any visitors when we came here, so this is a great chance to have a tourist attraction (almost) all to yourself. When you are done visiting the ruins in Trinidad, you should continue to Jesús. There are two ways to get there and both require you to walk back to the main street. Turn right and keep walking until you see a gas station to your left. This is the road leading to Jesús and from the intersection, you can either take a bus that is supposed to leave hourly or a taxi that will be waiting there for you. It is also here that you can find a small and cheap restaurant, if you get hungry. We went by taxi and paid 40.000 guarani for the round trip. Our taxi driver dropped us off in front of the ruins. The ticket you get in Trinidad is valid here as well and allows you to enter Jesús. Once we were done, the driver waited for us in the parking lot and took us back to the intersection in Trinidad. From here, you can easily catch a bus back to Encarnación. Just wave at any bus going past. The fare is another 10.000 guarani for going back to Encarnación. 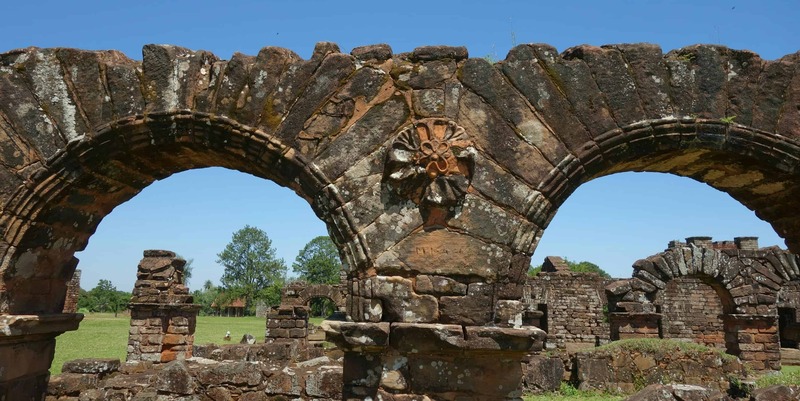 The Jesuit missions in Argentina are just as easy to visit as the ones in Paraguay. To get here, you have to start in Posadas. Try to arrive at the bus terminal early enough – the last bus you can take is at 12:30pm. You need to ask around the bus station for someone to sell you tickets to San Ignacio Miní. Don’t buy your return ticket yet, as you do not know how long you will need and can easily do so on the bus back. Once again, you should tell your bus driver that you want to go to San Ignacio so he can let you know where to get off. From the bus station, you walk northwards to get to the ruins. 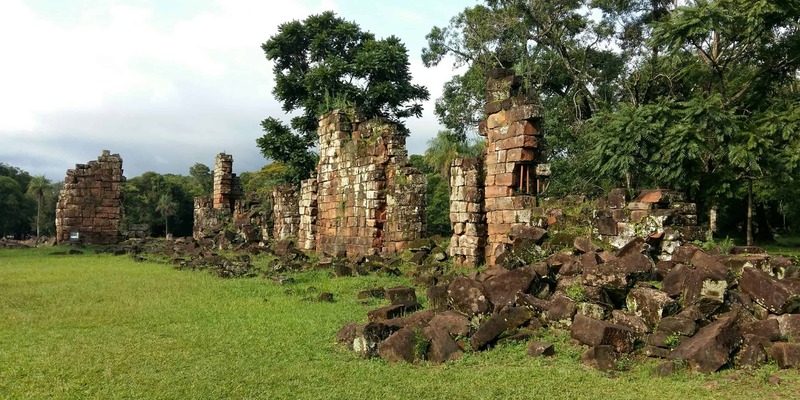 While the Jesuit missions in Paraguay are well preserved, standing tall in grassy areas, the ones in Argentina are overgrown by jungle. Some have been reconstructed, others have been left as they were found. The one in San Ignacio Miní is the one that has seen the most reconstruction and you can easily spend an hour or two here to see everything. Once you are done with the ruins, you need to get back to the bus station. While it is possible to visit the other ruins by public transport, it involves a lot of walking and takes a long time. The far easier way is to take a taxi from the bus station. We paid 450 pesos for the taxi (as of October 2017), including wait time at both Missions. The first ruins we visited were in Loreto. They are the most crumbled ones and in many places, you can barely see the rocks overgrown by jungle. From here, we went on to Santa Ana. At both ruins, guides showed us a museum and the layout of the missions, so we knew what we were looking at. From the mission in Santa Ana, it is a very short drive to the bus station. Our driver dropped us off here and a local guide selling delicious cheese bread helped us flag down a bus to get back to Posadas. In case there is nobody at the bus station (which is highly unlikely), just wave at a passing bus and say “Posadas” to the bus driver. They are very helpful. On a side note, I have heard of people who have done the missions on both side of the border in one day, starting in Argentina in the morning and then crossing over to Paraguay. It is doable with a taxi, but if you have come that far already, shouldn’t you take your time to properly enjoy those sites? Let me know if you’re planning on seeing the missions in Argentina or Paraguay. And if you found this guide useful, I would love to hear some feedback.